The crowded traditional Ultrabook space just got a new contender from a gaming laptop manufacturer. MSI's uncommon combination of an ULV Intel CPU and a Max-Q GPU gives it some interesting advantages over the Dell, but it still falls a bit short on some key areas. MSI has been sitting comfortably in its gaming laptop space for years. The MSI PS63, however, represents the company's first move into the traditional 15.6-inch Ultrabook space dominated by the likes of the Dell XPS 15, Asus ZenBook UX580, and HP Spectre x360 15. 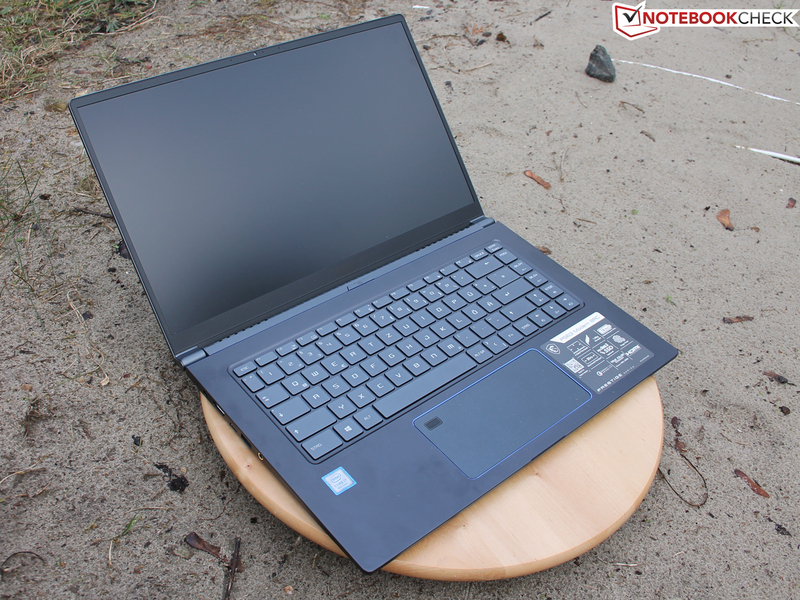 How does MSI's Ultrabook compare to the most popular 15.6-inch Ultrabook available? Consequential or not, the dimensions of the MSI PS63 are nearly identical to the XPS 15 but just over 1 mm thinner. MSI's major advantage lies in weight as the laptop is 300 g lighter than the Dell equivalent. Dell still has the upper hand in chassis rigidity. Its lid is especially stronger than the more flexible lid of the MSI laptop. MSI utilizes a 15 W CPU compared to the 45 W CPUs on the Dell XPS 15 9560/9570. Thus, even the last generation Core i7-7700HQ in the XPS 15 9560 is faster than what the newer i7-8565U in the PS63 is capable of. CineBench R15 Multi-Thread shows a performance boost of 30 percent and 110 percent when moving from the MSI to the i7-7700HQ and i7-8750H in the XPS 15 9560 and 9570, respectively. The GeForce GTX 1050 Max-Q in the PS63 is the lowest-end Max-Q GPU in Nvidia's GTX lineup. Fire Strike ranks it about 5 to 10 percent slower than the standard GTX 1050 and about 20 percent slower than the GTX 1050 Ti Max-Q in the fastest XPS 15 9570 configuration. Fan noise is significantly quieter on the MSI than on the Dell. This becomes especially apparent when running higher loads like gaming or heavy video editing and encoding. Both brightness and sRGB color coverage are lower on the MSI laptop when compared to the Dell. If outdoor visibility and color accuracy are top concerns, then the Dell would be a better option. Runtimes are generally longer than the XPS 15 by an hour or more depending on the battery size of the Dell laptop (56 Wh or 97 Wh). In fact, WLAN battery life can be nearly twice as long as the XPS 15 56 Wh version (11 hours vs. 5.6 hours). The biggest difference between the two laptops in terms of ports is the lack of Thunderbolt 3 on the MSI. Additionally, the MSI laptop relies on a MicroSD reader whereas the Dell has a faster full-size SD reader. MSI's decision to use a U-class ULV CPU compared to the H-class series on the Dell has resulted in some interesting advantages and disadvantages. CPU performance is certainly slower, but the overall package is noticeably lighter, quieter, and longer lasting. Outside of performance, there are a handful of aspects where MSI still falls short. The lid is weaker and more flexible, the system lacks Thunderbolt 3, SD reader transfer rates are slower, the display is dimmer, and color coverage is narrower. Even so, we're not expecting a first-generation MSI Ultrabook to instantly outperform the venerable XPS 15 series and we're hopeful that a future second-generation model can address all of these pitfalls and more. We recommend checking out our full reviews on the MSI PS63 and Dell XPS 15 9560/9570 below for more detailed information on each.